Charlemagne, or Charles the Great, was king of the Franks between 768 and 814, and emperor of the West between 800 and 814. He founded the Holy Roman Empire, strengthened European economic and political life, and promoted the cultural revival known as the Carolingian Renaissance. Charlemagne's rule greatly influenced Europe's push to create a unique civilization different from that of Rome or other ancient empires. Charlemagne, the son of Pepin the Short and Bertrada, was born in 742. Although his parents married before his brother Carloman was born, they were not legally married at the time of Charlemagne's birth, and he was thus thought to be illegitimate (born out of wedlock). In 741 Pepin had become mayor of the palace, and in 751 he deposed (removed from office) the last Merovingian king and was declared king of the Franks, a powerful Germanic tribe that lived in the region today known as France. Little is known about Charlemagne's childhood. In 754, however, he participated in the ceremony where Pope Stephen II appointed Pepin king. 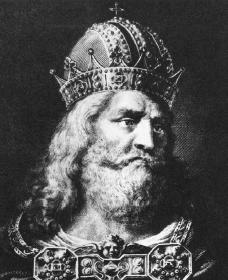 Charlemagne also joined Pepin on many military campaigns. When Pepin died in October 768, Charlemagne and Carloman were both proclaimed king and were to rule the kingdom together. In the division of the realm, however, Carloman received a larger and richer portion. Under these circumstances relations between the brothers turned sour. But Carloman died unexpectedly in 771, leaving Charlemagne the sole ruler of the entire kingdom. Charlemagne moved aggressively, especially in Italy, to remove those who threatened his power. He immediately attacked and defeated King Desiderius of the Lombards. Shortly thereafter Charlemagne was crowned king of the Lombards at Pavia. The Frankish conquest of Italy—first of Lombardy in the north and later Benevento in the south—brought new wealth and people into his kingdom. During his Italian operations Charlemagne also declared war against the Saxons, a Germanic tribe who threatened the northeastern frontier of Francia. Begun in 772, this cruel and bitter war finally ended in 804. Francia absorbed the land of Saxony and enforced the Christian religion on the Saxon tribes. On his eastern frontier Charlemagne defeated Tassilo, the duke of Bavaria. To his empire Charlemagne added the Bavarian duchy, or territory controlled by a duke. He divided the western portion of the duchy into counties, each controlled by a count loyal to the king. Further to the east the major power and ultimate threat to the Frankish realm was the vast Slavic kingdom of the Avars, or Huns, an Asiatic tribe that had settled along the upper Danube River. Between 791 and 795 Charlemagne crushed the power of the Avars and added their kingdom as a state. This victory opened the entire Danubian Plain to German colonization and the eastern expansion of Christianity—the beginning of the Drang nach Osten, or push to the East. By 800 Charlemagne had succeeded in greatly extending his power while crushing several enemies. He ruled all of the Christianized western provinces, except the British Isles, that had once been part of the Roman Empire. As the sworn protector of the Church, Charlemagne was in fact the political master of Rome itself. The papacy, or office of the pope, also recognized Charlemagne's power. The pope crowned Charlemagne Holy Roman Emperor on Christmas Day, 800. Charlemagne attempted to create unity and harmony within his vast realm and to support laws and promote learning that would achieve his goals of the empire. Charlemagne, in contrast to his Merovingian predecessors (who constantly traveled throughout their realms) attempted to create a fixed capital to rival that of Byzantium, an ancient culture legendary for its beauty and wealth. The major record of Charlemagne's personal achievements is the Vita Caroli Magni, the first medieval biography. Written by Einhard between 817 and 836, this biography is largely a firsthand account, as Einhard was a member of the palace school during Charlemagne's reign and was his close associate. In the Vita is the actual physical description of the man who has since become one of the greatest legendary heroes of the Middle Ages (476–1453 C. E.). Toward his friends Charlemagne was lighthearted, and he particularly enjoyed the company of others. Yet toward his enemies he was often a cruel warrior feared for his strength and ability. Although primarily a man of action, he had great admiration for learning and spoke Latin fluently. He studied Greek and the liberal arts and thus combined, to some extent, the personality of a warrior and a scholar. What is most striking about Charlemagne's rule was that he was able to maintain, largely through the strength of his own personality, a centralized state wherein royal authority came first. Charlemagne also maintained a small group of the best warriors, the vassi dominici, who helped him enforce his authority. During the course of his reign Charlemagne sent a number of written instructions to his officials. These enactments, known as the Capitularii had the force of law and were executed directly by the royal agents. They are extremely valuable as sources in understanding the social and legal structure of Carolingian France. In general, Charlemagne's reign was a period of internal calm and prosperity because of his military and political ability. He succeeded, through diplomatic negotiations, in having his imperial title recognized by the Byzantine emperor. Through his program of cultural revival and changes to the Church, he succeeded in improving the level of civilization in the West. Charlemagne's support of the arts and letters had several purposes beyond the general improvement of culture and literacy in the empire. One of the major purposes was to provide an educated clergy (a group of religious servants) that could undertake many of the administrative tasks of government. A second purpose was to win the acceptance of orthodox doctrine, or rules of the church, as well as a uniform religious practice throughout the empire. Such uniformity not only strengthened the Church but also centralized the administration of the empire. Still, a third purpose of this cultural revival was to improve the status and authority of Charlemagne himself, who thus appeared as the defender and protector of the Church, of orthodoxy, and of education. The intellectual traditions and educational institutions supported by Charlemagne greatly influenced the development of Western culture. Charlemagne expanded the number of schools, and the quality of education was greatly improved. In 806, at the age of sixty-four, Charlemagne took measures to provide for the succession of his empire. He divided the realm among his three sons—Charles, Pepin, and Louis. But the death of Charles in April 810 was soon followed by that of Pepin. The remaining son, Louis, later called "the Pious," the least warlike and aggressive of the three, was left as the sole heir to the empire. He was crowned by his father in 813. The last years of Charlemagne's reign saw difficult times. Civil disorder increased as did disease and famine (drastic food shortages). Additionally, there were troubles on the frontiers. In many respects, the future looked dark. In 811 Charlemagne made his final will, giving a more sizable portion of his treasures to various churches of the realm than to his own heirs. He died on January 28, 814, and was buried at his palace at Aachen. Bullough, Donald. The Age of Charlemagne. 2nd ed. New York: Exeter Books, 1980. Collins, Roger. Charlemagne. Toronto: University of Toronto Press, 1998. Lamb, Harold. Charlemagne: The Legend and the Man. Garden City, NY: Doubleday, 1954. Riché, Pierre. Daily Life in the World of Charlemagne. Philadelphia, PA: University of Pennsylvania Press, 1978. How do Charlemagne die? We know when he died but not how he died. I would like to know abou how big his kingdom was when he died.